Who says eating healthy can’t taste indulgent? 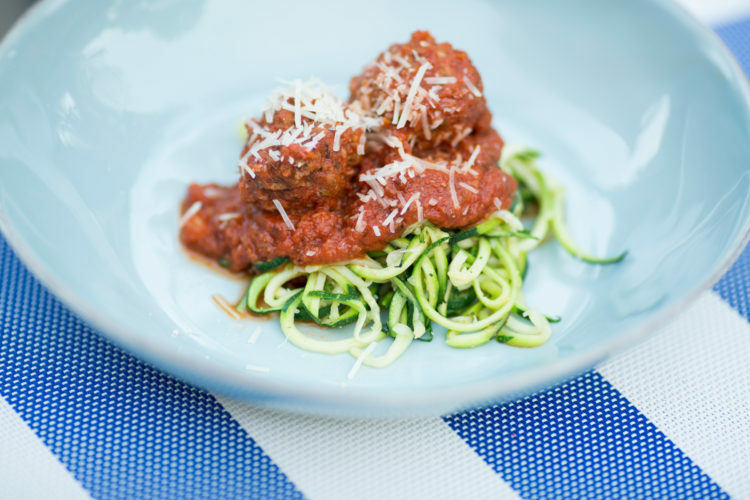 The large, lean meatballs that top these zoodles are packed with protein and classic Italian flavors. And the zucchini noodles are the perfect vehicle for sopping up all of the spicy, garlic marinara sauce. I haven’t spent much time in the kitchen this week, thanks to a nasty head cold I caught a couple of days ago. I usually throw together a pot of this soup when I get sick because the spiciness seems to help with congestion, but I haven’t had the energy. Thank goodness for Rush Hour Station’s Anger Management soup — it instantly made me feel a bit better. I did get a chance to test out a new zoodles recipe earlier this week and I was really happy with the results. Have you hopped on the zoodles bandwagon yet? I’d had them before but hadn’t ever served them to James because I was worried he wouldn’t be able to get past the fact that he was eating zucchini. I was pleasantly surprised when he cleaned his plate at dinner and demolished some leftovers at lunch the next day. He kept calling this “zughetti,” which cracked me up. I’m not going to tell you zoodles are just as good as regular pasta because that would be a lie. I’m a pasta lover and, in my opinion, you just can’t beat the real thing. But, because life is all about balance, I try to opt for zoodles more often than classic spaghetti. They’re delicious, but in a different way. For me, the key to making zoodles a hit is in the sauce. The meatballs cook in the marinara instead of in the oven, giving them more flavor and reducing the number of dirty dishes. I use this OXO hand-held spiralizer to make my veggie noodles. It’s easy to use and much easier to store than some of the larger, countertop spiralizers. You can usually find them at Bed Bath and Beyond and sometimes TJ Maxx. 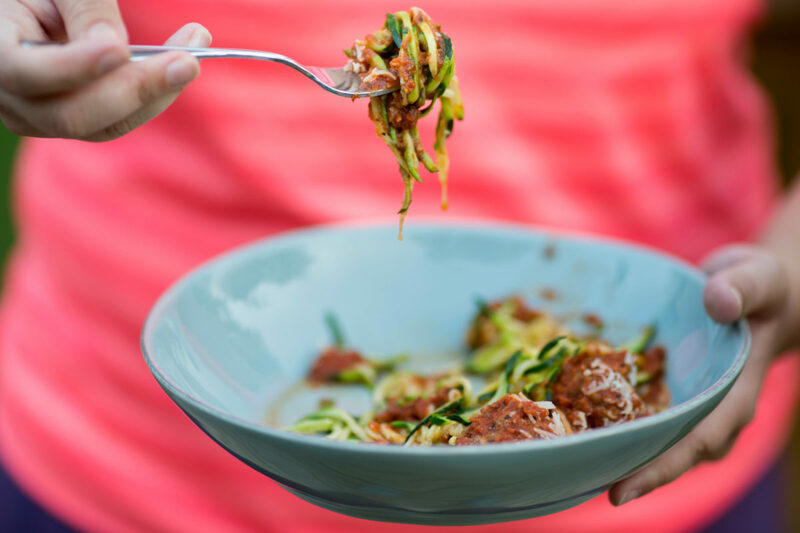 Use a spiralizer to cut zucchini into noodles. If the zoodles are longer than regular spaghetti, cut them in half. Place zoodles on top of paper towels and sprinkle with salt. Place another paper towel on top of the zoodles, press down and let zoodles sit for 15 minutes. This will ensure your zoodles don’t end up soggy. 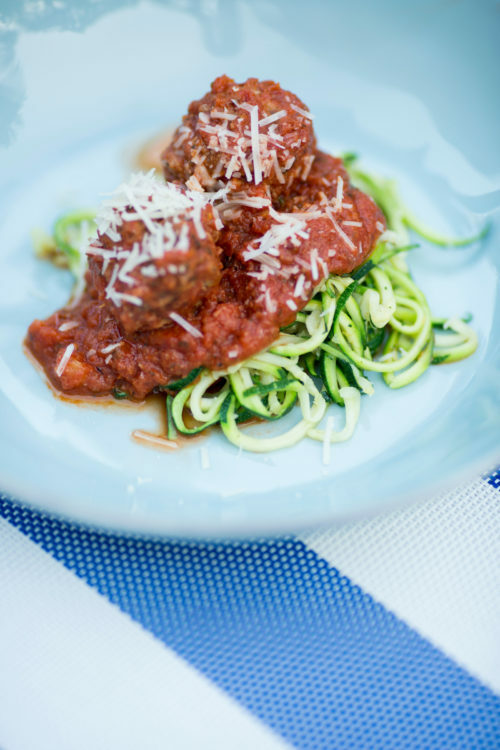 While zoodles are resting, make the meatballs. Place breadcrumbs, parmesan, egg, milk, fennel and garlic salt in a large bowl. Whisk until combined. Add meat to the bowl and use your hands to mix until just combined. Roll meat mixture into 24 1-inch meatballs. Set aside. To make the sauce, heat olive oil in a large pan over medium-high heat. Once the oil is warm, add garlic and red pepper and stir constantly until garlic turns slightly golden, about one minute. Add remaining ingredients and bring the sauce to a boil. Once sauce is boiling, carefully place meatballs in the pan. Reduce the heat to simmering and cover. Let meatballs cook for ten minutes before flipping them over, then allow them to cook while covered for five minutes more. Remove from heat once the meatballs are cooked through. To cook zoodles, heat olive oil in a large pan over medium heat. Once oil is hot, add zoodles to the pan and cook for three to five minutes, stirring occasionally, until the noodles reach your desired tenderness. Remove from heat and top zoodles with meatballs and sauce.